Painting, dyeing or stamping textile surfaces can be done in many ways, depending on the process the artist is using. You can tape your fabric to a flat surface, pin it into a foam- and plastic-covered plank, or stretch it above your table surface. I find painting on stretched silk the most mesmerizing — as soon as you touch your brush to the fabric, the color spreads itself across the fibers until it either runs itself out or meets a resist line barrier. 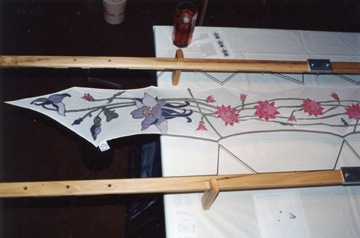 Most of my silk paintings are done on a wooden stretcher frame. You can buy a good one from Susan Moyer (pictured at right) or Dharma Trading, but they are an investment. If you’re just learning the ropes and haven’t decided just how many dollars you’re going to invest in silk painting, an easy alternative is to make your own frame. 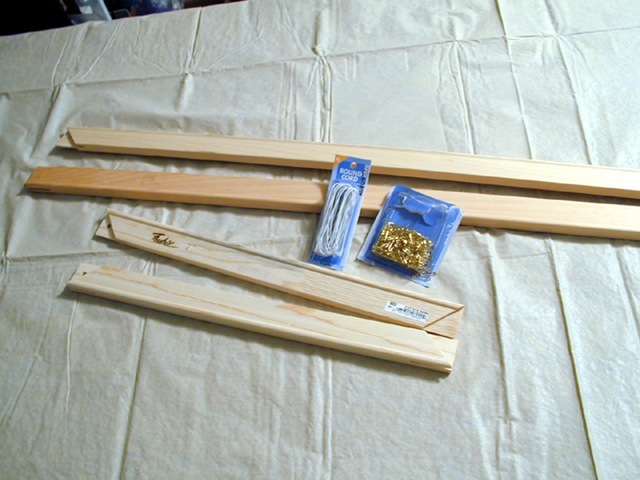 The supplies include four canvas stretcher sides, round elastic, brass safety pins, nails and a hammer or a staple gun. It shouldn’t cost you more than about $20.00. Susan Moyer requested that I remove the rest of this post. It never dawned on me that tacks, safety pins, and elastic might be a copyright imfringement! Apologies. Entry filed under: All Posts, art and artists, processes in silk painting / surface design. Tags: Althea Peregrine, AltheaP, how-to, Janine Maves, silk painting, stretcher frame, surface design. This is wonderful of you to share this info Janine.